CH Technologies (USA) has purchased the rights and remaining stock of the Collison nebulizer. This purchase, from Mesa Laboratories, along with associated Intellectual Property, vendor lists, and patent, was completed on October 12, 2017. The Collison Nebulizer, manufactured by CH Technologies, has long been the recognized technique for the aerosolization of various liquids in a wide array of applications. 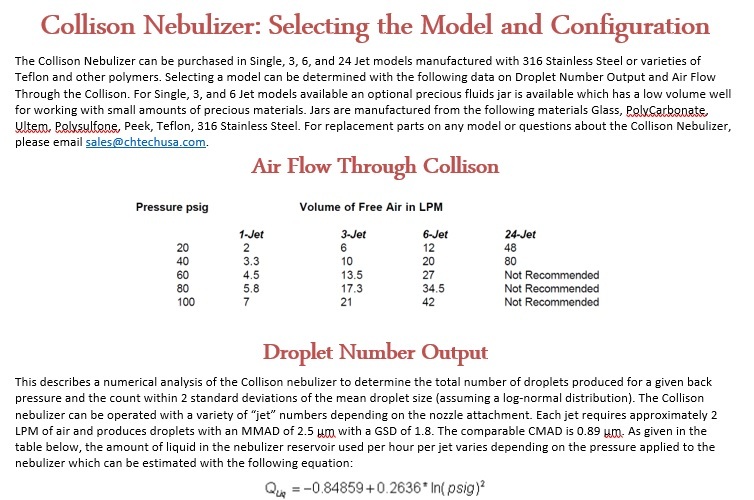 The method of aerosolization utilized by the Collison Nebulizer relies on the Bernoulli principle. When air moves at high velocity through the nebulizer's small orifice, it in turn, suctions liquid from the nebulizer's jar and breaks it apart into small droplets. This atomized liquid is then impacted against the walls of the jar and then generates even smaller droplets. Larger particles are removed from the aerosol by specially designed traps or a curved outlet tube. 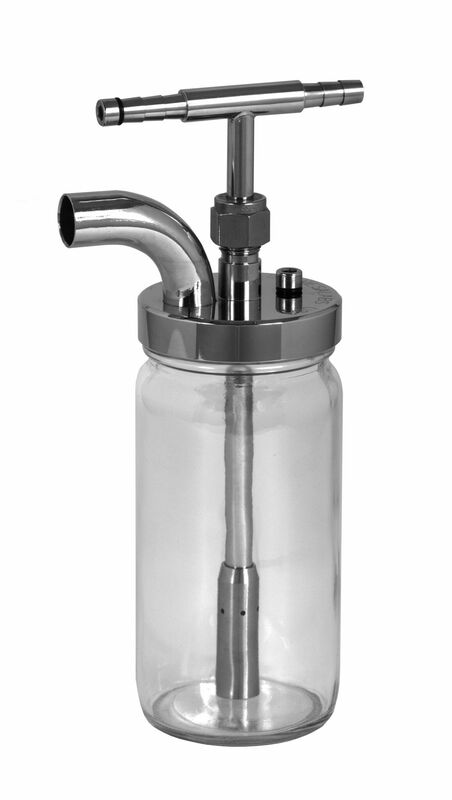 The Collison Nebulizer has a glass jar standard; break resistant polycarbonate, ULTEM, and polysulfone jars are optionally available in order to provide the utmost protection from accidental exposure due to high stress or temperature conditions. If desired, an optional 316 stainless steel jar is available to ensure maximum durability and safety standards in special applications. Also, if desired, an optional higher temperature tolerant model is available. See image for temperature details. The Collison Nebulizer may be equipped with a Precious Fluids Jar that utilizes a 5 ml well at the bottom of the jar. This is intended for use with materials that are expensive or difficult to obtain. An extension sleeve pushes over the end of the Collison nozzle and dips into the well. With the use of an extension sleeve, the nozzle remains in a higher position so that the nozzle's output may properly impinge upon the jar. An optional external fill adaptor is designed to permit the instrument to be intermittently or continuously replenished without interrupting a procedure. Liquids injected into the device emerge at the bottom of the nozzle and do not interfere with the generation of an aerosol. This allows for the uninterrupted operation of the Collison Nebulizer over long periods of time. For Purchasing Options, Please See Our List of Distributors. ***For more information on model selection, please see the document to the right.